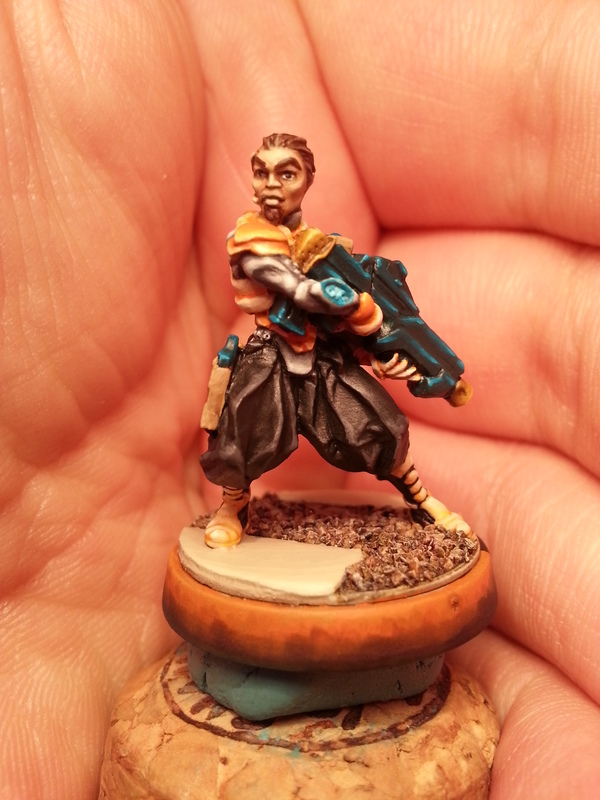 Infinity is a science fiction based skirmish game that really has beuatiful models. Awesome stuff and so tiny and super detailed it is killer! It is a game a friend and I really wanted to get into mostly because we enjoyed the look of the models and we needed a bit of varitey to what we’re currently playing mostly (Malifaux). So in the day I picked up a starter pack of the game’s newest faction: The Tohaa. Some funky alien race of awesome looking models. I kind of got hooked and also picked up a Haqqislam Bahram pack and some extra models and eventually kept buying stuff until I had over 1o models of each faction. I did get carried away a bit, but I think this kind of behavior in the hobby is actually rather common, seeing as most painters are always backlogged on stuff to paint. My issue was, when it came to painting… I just couldn’t feel the models. I would think up some neat colors and ideas for schemes to unify the soldiers and nifty models, but I couldn’t apply them anywhere. When I held the model I just sat there and blanked out. It may be odd but I just couldn’t get any nifty ideas with the models and eventually they started gathering dust. Eventually this bothered me since I really wanted to play but I couldn’t force myself to paint the models I had. So I sat down and went through the entire range of models the game has to offer, looking for the set of models that caught my eye. The set of models that would inspire me to paint something on them. While searching I found two really cool squads that I like, but had to make a decision, which group I would play first. 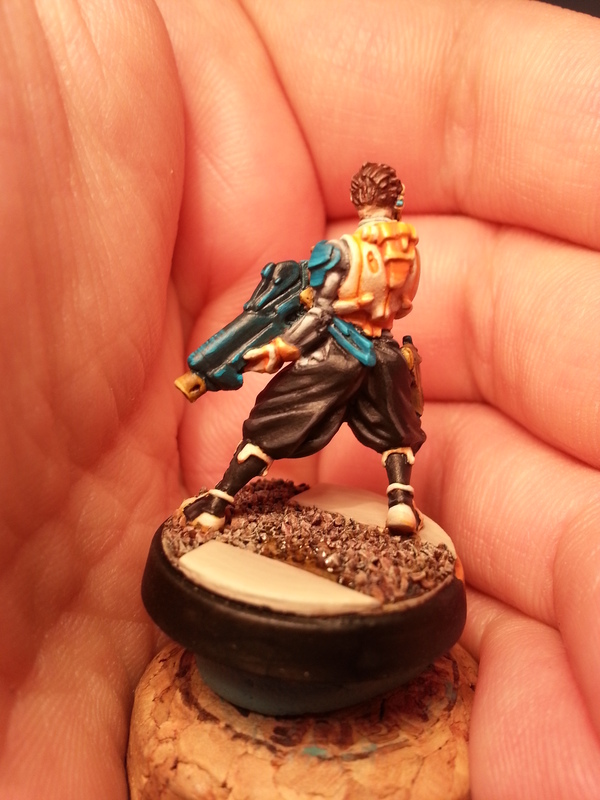 Either the Yu Jing’s Japanese Sectorial Army (JAS for short) or the Nomad’s Bakunin group. I chose the JSA, mostly because I actually liked the Nomads better (saving them for last) and the JSA also has damn awesome motorcycles. Here’s my first painted Infinity model. This is one of the JSA’s regular troops, a Keisotsu. I had a fun time painting this guy. I mean come on, he has freaking MC Hammer pants on. Can’t touch this! I enjoyed tossing around the oranges and turquoise colors on this model. I wanted to work with some drastic contrasts and similar to my Showgirls in Malifaux, this squad was supposed to work around those colors. Basically this is the starter box sans the Heavy Infantry and for that an upgraded Oniwaban, Aragoto and two more Keisotsus. I really am looking forward to trying out this group. Cheers! ← Orange skin, green skin. Twisted worlds.